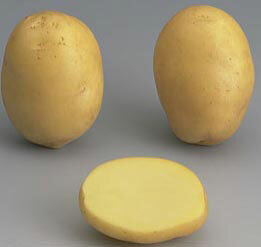 Tuber: Long, regular, very shallow eyes, yellow skin, yellow flesh. Sprout: Purple, spherical, strong hair. Plant: Tall, upright habit, semi-branching type. Stem: Weak pigmentation, with developed wavy wings. average, rounded oval (1 = 1, 68); limbus plan. Flower: White, partially pigmented flower bud. Grading: Proportion of large tubers: very high in Forte. disease Sensitivity: Leaf blight: fairly susceptible. sensitivity to sprouting: Rather slightly susceptible. blackening after cooking: none, very good fry color.